Ever since the dawn of the Industrial Revolution around 1900, construction has consistently ranked as one of the most dangerous occupations in America, largely due to the Fatal Four. The Occupational Safety and Health Administration estimates falls, electrocutions, struck by object (like a falling tool) and caught between two objects (like an elevator or lift) causes over half the construction accidents in Rockford. Complicating matters even further, modern construction sites often employ workers with construction skills, but limited English proficiency. These workers may not understand how to use certain safety features. That failure of communication, which is the employer’s fault, may contribute to claims outside the workers’ compensation system, as outlined below. 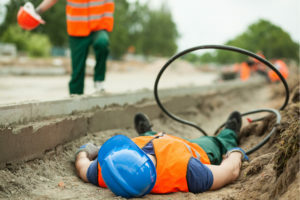 Because of the serious injuries the Fatal Four and other such incidents cause, injured construction workers are usually entitled to substantial compensation. The amount often hinges upon the background facts of the claim. Occupational diseases, like gradual hearing loss. The compensation available is the same as well. Injured victims who file construction accident claims are entitled to money for lost wages, medical bills and other economic damages. But in other ways, the system is completely different. As mentioned, the bureaucracy is much larger today than it was a 100 years ago. For the most part, rich insurance companies dominate this bureaucracy, therefore, the outcomes are usually not worker-friendly, at least initially. At the first review, most examiners deny most claims, at least in part. Fortunately, at the appeal hearing, things are a lot different. Attorneys may introduce evidence, cross-examine witnesses and make legal arguments. An effective Rockford construction accident lawyer often makes a tremendous difference. At both the initial examination and the appeal, construction accident victims do not have to prove negligence or fault to obtain benefits. Can I File a Civil Claim for Damages? Injured victims may be able to sue outside the system if the employer was extremely reckless. For example, a government inspector might tell an employer a construction site is dangerous and the employer might send workers to the site anyway. If a worker is injured in that context, the victim is entitled to additional compensation for non-economic damages, such as pain and suffering. The downside for the worker is the victim/plaintiff must also establish negligence, or a lack of ordinary care. Workers’ compensation is not the exclusive answer to all work injuries. A personal injury claim may also be sought in some construction accident cases. Some prominent examples include defective product injuries and injuries due to a negligent co-worker. Construction accident victims may have several legal options. For a free consultation with an experienced workers’ compensation lawyer in Rockford, contact Fisk & Monteleone, Ltd. In these cases, we do not charge upfront legal fees.